Even though we speak about balloon flight routes, we must explain that a balloon cannot be steered to any direction. The balloon is at the mercy of the winds, within them. Nevertheless the pilots can play with the wind flows and find the most convenient direction. Thus to fly over certain specific places we choose the right launch site according to the prevailing winds. Due to these factors every flight is different from each other even when flying in the same place. The following places we mention are some of the frequent flight destinations, with a small description of a typical flight. 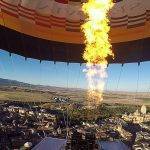 Due to hot air ballooning characteristics it is difficult to repeat such flight with exactitude. Even so, the passenger may get an idea of the sensations and views that he/she will enjoy on board in each flight zone. These are some of our flight routes and our frequent destinations. There are flights programmed every month in these zones and we also have other flights aside from programmed ones. MADRID. Middle section of the Guadarrama River Regional Park and mountain range towns. MADRID. Aranjuez, palace and gardens. SEGOVIA. RECOMMENDED DESTINATION! World Heritage city and its surroundings from above. VALLADOLID. Fly over the city and the Pisuerga River. SALAMANCA. World Heritage city and its surroundings from above. TOLEDO. World Heritage city and its surroundings from above. MÉRIDA. Extremadura’s capital, World Heritage city and Guadiana River from above. 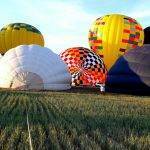 Choose any of our balloon routes to find more about the balloon ride in each location and other details. These are our frequent fly routes, nevertheless we fly all over Spain. If you are interested in flying in other areas please contact us for information by telephone or by e-mail. 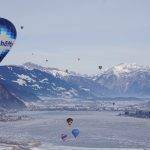 You can also click in our Recommendations page and visit our recommended recommended sites after the balloon flight to further enjoy your chosen destination. Remember that we are at your disposal to solve any doubt. Choose date and flight zone, book your flight with us in 5 minutes and receive your tickets immediately. How much heat does a hot air balloon burner generate? Is it possible to fly during the whole year? Does the takeoff cause fear or vertigo?